In August 1877 members of the Salford Highways Committee were invited to the works of the Carriage Company in Ford Lane, Pendleton to inspect two special workmen's tramcars, designed by John Eades. His specially designed workmen's cars were capable of carrying 50 people, 22 inside and 28 outside, but his major innovation was in a smaller vehicle for 32 passengers (16 in and 16 out) being constructed at the same time. This was the Eades Patent Reversible Tramcar for which he filed patents in 1877. After inspecting the first model, the Committee gave permission for its trial use for one week, first on the Pendleton route then on the Broughton service. A further inspection in September 1877 resulted in permission to use the car permanently, but with recommendations that on future cars the inside height of the ceiling should be raised six inches, and that the platform should be slightly enlarged. John Eades was a coach-builder and the manager of the Pendleton works of the Manchester Carriage Company. 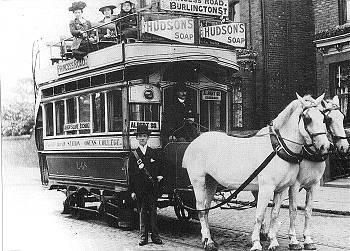 In 1877 he produced a prototype of his reversible tram and tested it in Salford. In June of that year he filed for a patent which with minor amendments was granted in December. The Eades Patent Reversible Car could be worked by stud of eight horses, as against twelve for an ordinary car. But its biggest advantage was that its body, held in position by a locking pin, was able to swivel on its underframe, enabling it to be turned round at the end of a journey with horses still in harness and with the driver remaining in his seat. It was said that such a car could reverse in four seconds. The reversible apparatus allowed the builder to dispense with the second platform, so that it was cheaper to construct, as well as offering economies in operation. The prototype was described as "the roof is reached by two stairs at the rear of the car, the dangerous side step being thus dispensed with. Each axle has a compensatory wheel, enabling the car to traverse the sharp curves at street corners without grinding. The vehicle is also provided with springs which give an agreeable elasticity to the motion and reduce the jolting when any hard substance lies on the rail. The interior of the car is airy and comfortable". Beside the driving position there was a lever which locked the body to the truck. Braking was as in a normal horse car with brake beams, a sway bar and pull rods, but the chains between the pull rods and the brake staff would be unhooked by the conductor when the car was turned. At the trailing end there was an emergency brake wheel mounted on the nearside saloon bulkhead similarly linked by a chain that could be unhooked. The sway beam was slightly extended to the solebar where a hinged rack device could be engaged to hold the brakes on during reversal. Wheels on one side of the car were free to revolve on the axles to provide a differential effect. Over 500 Eades cars of similar design were built by the Manchester Carriage Company for use in the Manchester and Salford area. In addition many more Eades trucks with various bodies, a few single deck, were built under licence by the Ashbury Railway, Carriage and Iron Co. Ltd. of Openshaw, Manchester. In addition to Manchester and Salford, places where Eades reversible trucks were used include Liverpool, Leeds, Bradford, Stockport & Hazel Grove, Chesterfield, Wallasey, Sheffield, Dundee, Newcastle, South Shields, Sunderland, the North London Tramways Company and the Tramways Sud in Paris. From "The Manchester Carriage & Tramways Company" book by Edward (Ted) Gray published in 1977 by the Manchester Museum Society. If using information obtained on this website on another website, please provide a suitable acknowledgement. If you can add our information or wish to comment, amend or correct any details published here please email me by clicking on the following icon.